dSCi/PARPAR split [A BESTA 038] by PARPAR/dUASsEMIcOLCHEIASiNVERTIDAS A pair of new releases from Portuguese label A Besta (and friends) – the first a split between free jazz noise rockers PARPAR and the similarly minded dUASsEMIcOLCHEIASiNVERTIDAS (dSCI), the second a manic live set from Parpar captured at the album release show – together offer an immersive dunk into Lisbon’s anarchic underground. The split release kicks off with dSCi’s “Jean-Louis is not a crime.” Boris (bass), Desmarques (guitar), and Diogo (drums) thrash through the opener with wild abandon, effectively setting the tone with a madcap pairing of Naked City’s abrasiveness and Devo’s playfulness. However, the band’s bag of tricks doesn’t end there. Second track “Glut” turns on a dime from rhythmic staccato blast of drumbeats and herky-jerky riffs to a spaced-out guitar extravaganza and back again, while the aptly-named “Dr. 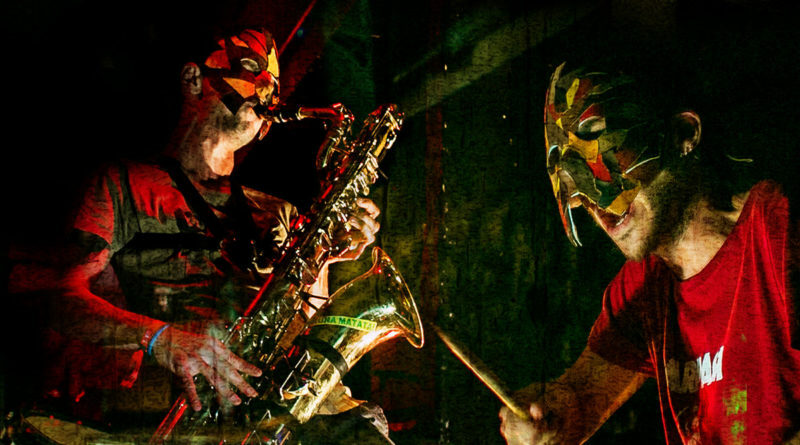 Musculo” has a funky sci-fi flavor thanks to its lethargic backbeat and distortion effects. In contrast, PARPAR (the duo of João Sousa on drums, percussion, and effects and Pedro Arelo on baritone saxophone, drones and loops with additional bass from André Calvário aka Jorge) veer off into more avant-garde territory on their side of the split. These three longer tracks see the pair exploring the psychedelic opportunities of free improvisation in a way not unlike Sousa’s work in labelmates (and Global Garage favorites) Uivo Zebra. Closer “Hukhuk” is a particularly impressive piece of work that can best be described as doom jazz. This EP would be treat enough, but A Besta also saw fit to bless us with SWEATY SWEATER — a recording of PARPAR’s album release party at Lisbon’s Sabotage Club. Video footage on YouTube gives us a glimpse of the night’s proceedings, but even without this visual document, the live recording captures the grit and grime of the night down to every last sweaty detail. The set includes tracks from throughout the band’s discography and concludes with an extended version of “Paipai” off the new release. By the end of its nearly 13-minute runtime, I collapsed into an exhilarating exhaustion — the kind that greets all those around the world who descend into the city’s centers at night and emerge, bleary-eyed and blissed out, to greet the new dawn.